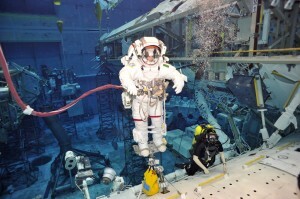 On March 5th I had my first suited EVA training event in the Neutral Buoyancy Lab in Houston. Here are some impressions from that special day. Days like today don’t happen often. Days when you experience something radically new. Days when unusual constraints force you to rethink your interaction with the environment, when your brain learns to give new meaning to sensory information, when your muscles acquire new patterns of movement to overcome previously unknown impediments. Days when you learn to be a cyborg. On such days even your eyes can betray you for a moment. As the crane lowers me into the water of NASA’s Neutral Buoyancy Lab, it takes a few seconds for my eyes to adjust and refocus. The effect of the visor is such that objects seem to be further away than they really are. As a result, the tremendous size of the giant 12-meter-deep pool appears even greater. In it lies a dormant creature of metal: a faithful replica of the International Space Station, outlined in its external contours. The shells of the pressurized modules, the truss segments, the antennas, the cables… all that and many more details are duplicated in this underwater world to provide astronauts with a realistic environment in which to train for Extravehicular Activities (EVA). I have been extensively briefed on all aspects of today’s work and I have explored the Station under water several times while scuba diving. Yet it feels utterly different, almost surreal, to be looking at it from inside the suit. By the end of my EVA training flow I will have become intimately familiar with the Station, with the translation paths, the worksites, the hazards. But today’s three-hour run is mainly for me to become accustomed to the EMU, the pressurized suit that allows astronauts to perform spacewalks in space. On orbit, the suit is a closed-loop life support system that provides oxygen, ventilation, cooling and CO2 scrubbing. In the pool the life-support backpack is inactive and our survival underwater is guaranteed by an umbilical that ties us to the surface and supplies us with Nitrox to breathe. To prevent overheating, water is circulated through 80 meters of tubing woven in our full-body Liquid Cooling and Ventilation Garment (LCVG). 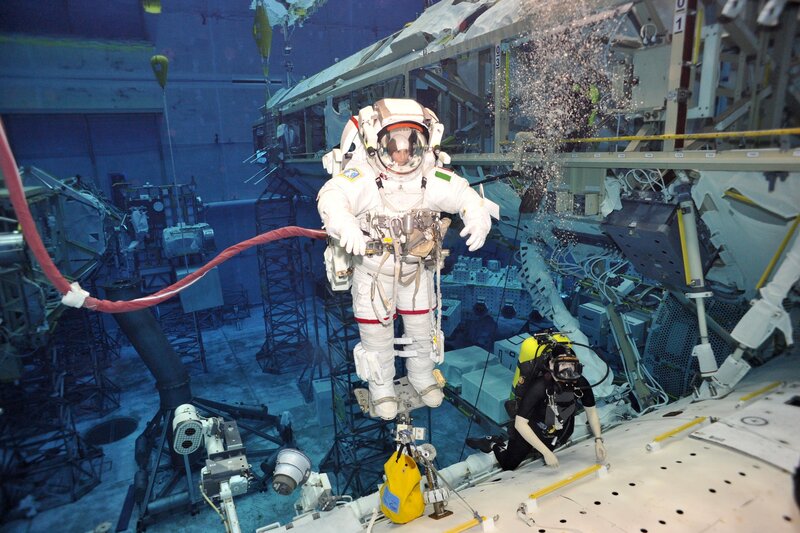 When we speak on the voice loop, the whole facility hears us: the other suited astronaut in the water, the support divers, the test director, the environmental control console operator and, of course, the instructor in the control room. The latter is typically the one talking to us, as he follows our every move on four camera views: two from our helmet-mounted cameras, two from the camera diver assigned to each one of us. “Us”, by the way, is me and veteran spacewalker Tracy Caldwell, who is determined to make this both an enjoyable and an effective first run for me. I couldn’t have asked for a better coach. For the next three hours my main task is to explore the limits of the suit, to identify my work envelope in it, to get accustomed to its size and to the limited field of view, to practice translating and reorienting my body, to pinpoint possible improvement areas in the suit fit. There is no rotating the arms outside of the limited envelope allowed by the shoulder joints. There is no turning the neck to look up or to the side: the whole body has to pivot. There are no quick movements: changing one’s orientation requires deliberate effort and patience. “Don’t fight the suit!” is the common mantra. If you do, you’ll only exhaust yourself. I remind myself of that as the safety divers release me from the donning station and we all descend together to the bottom of the pool. As the water pressure increases, the suit compensates to maintain an overpressure of about 4,3 psi. A rubber Valsalva device is glued inside my helmet: I can press my nostrils onto it to equalize my middle ear as pressure increases. 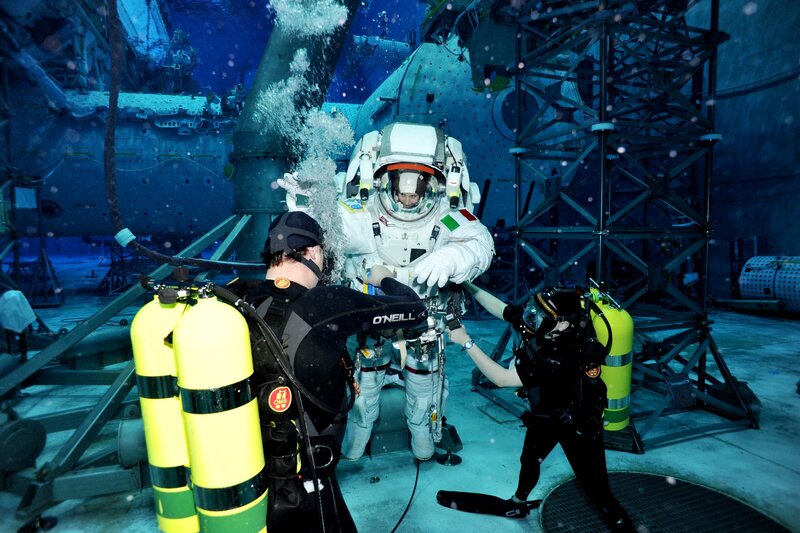 Once at the bottom, the divers start working on the weighout: by distributing weights in different parts of the suit they establish neutral buoyancy and then try to neutralize the tendencies of the suit to rotate. The more these buoyancy-related effects are minimized, the more effective and orbit-like the training will be. It’s really an art, rather than a science, and the expertise of the divers is precious. Since this is my first weighout, there is no baseline to start from and the process takes a bit longer. I don’t mind at all. Right now I am simply overcome by happiness and I am thankful for having the time to relax in the suit and savour this exhilarating moment! Some simple tasks are incorporated into today’s introductory run. After practicing translating along the truss and on the US Lab along handrails and soft gap spanners, I have a chance to use the Pistol Grip Tool, a motor-driven screw driver, to release some bolts on the GPS antennas. Then the divers swim me to the airlock and I get to try the translation path to the front face of the truss and do a safety tether swap there. I also get my first experience with entering the Portable Foot Restraint – quite a challenging task! – and I practice retrieving tools from the external toolbox. Last but not least, I start to grasp the challenge of using the Body Restraint Tether, and this is probably worth a story of its own. We conclude the run with a ten-minute exposure to the effects of being inverted – not a problem in real weightlessness, of course, but somewhat an issue in the pool. Finally, just beneath the water surface, the overpressure in the suit is reduced for safety considerations and then the divers remove one of my gloves, so that I can experience a sudden depressurization. After three hours, a mere half of the nominal 6-hour duration that trainees reach by the fourth run, I am quite exhausted. The most trivial tasks in the suit require physical effort and mental concentration and the limited field of view, range of motion and tactile perception make it difficult to maintain awareness of oneself and one’s surroundings. I know very well that big challenges lie ahead. Yet it is truly exhilarating to have taken the first step on this path. This is a day I had been looking forward to for a long time. It’s my first day as a cyborg, and the cyborg can survive in outer space. Thank you for staying in touch; check out 60 minutes last Sunday talk with Elon Musk AND there’s MORE see ya soon when I down load my photos have a great ONE!! Thank You Samantha for sharing with us your wonderful experience! How many of these sessions must be made ​​before being qualified for EVA activities? There are four introductory runs, followed by the EVA skills flow, which is a minimum of four runs plus the exam. 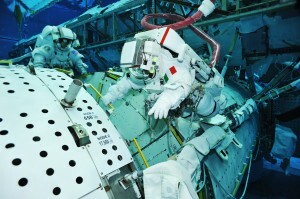 Once assigned to a crew you need to practice in the NBL a number of failure scenarios that would require a contingency EVA. If you are assigned a planned EVA you also need to prepare for that before your flight. Always great to read your blog! Grazie Samantha! I would have some questions about the EVA. Why did you train with the US EVA suit whereas Thomas and Tim trained with the Orlan one? Are you going to train with both? I was at JSC last week and the astronaut who gave me the tour said that both were really different and I understood from what she said that the Orlan suit was kind of more convenient. So which one is more used for ISS? For Hubble? Why? Sorry it’s a lot of questions… Merci infiniment et au plaisir de vous lire bientôt ! We are all on the different training programs, so it just happens that some of use are training in the EMU, while others got a chance to train in the Orlan. Awesome blog post – you are a very good writer because you can describe these events in such personal detail! Firstly, is the Valsalva device there for your personal comfort or is there no other way to relieve middle ear pressure differences while inside the suit? Also come to think of it, would have the same problem during a spacewalk? Secondly, I thought the point of NBL was that they used buoyancy to simulate microgravity (okay, I’m quoting this from an article by Kimiya Yui that I translated earlier today), but I see from your article that they can also alter the weight distribution in the suit. I assume this is done via computer, but how can you make the suit “heavier” without adding weights?? Most people need a Valsalva device, but there are also people who can compensate pressure change just by swallowing or moving their jaws. Nice skill to have as a diver! The weight distribution in the suit is done by physically inserting different weights (or, on the contrary, foam blocs) in different locations on the suit. Not only you need to make it neutrally buoyant, so that it doesn’t rise or fall in the water, but you also need to stabilize it rotationally. I’ll post more about this soon. 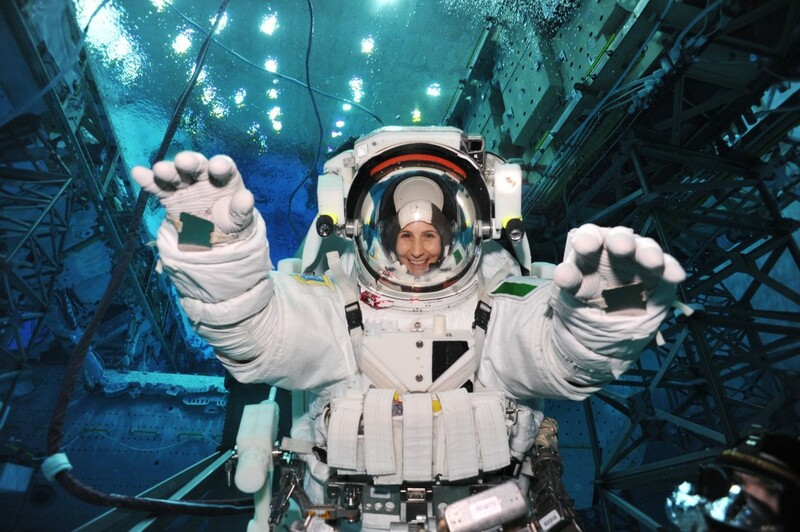 Quite an interesting experience, but donning a spacesuit does not make one a cyborg. Once pantropy occurs, spacesuits – and terraforming – will be obsolete.